The church is dedicated to Saint-Pierre-ès-lien. The basis of the tower is the only remains of a previous building (1742). The whole buiding that we can see today was rebuilt between 1842 and 1849 from the plans of Bourdeau, architect in Lannion. It could date back to 1850 and we ignore the name of its builder. It was attributed to Reverend Emile Clergeau. It is a small instrument (8 stops) even though it has a big composite and luxurious case : the back positive, the echo horn and the small keyboard are factitious : however, the illusion is perfect. It is obviously a rare version of the « de luxe » model of the Clergeau series in a baroque style. 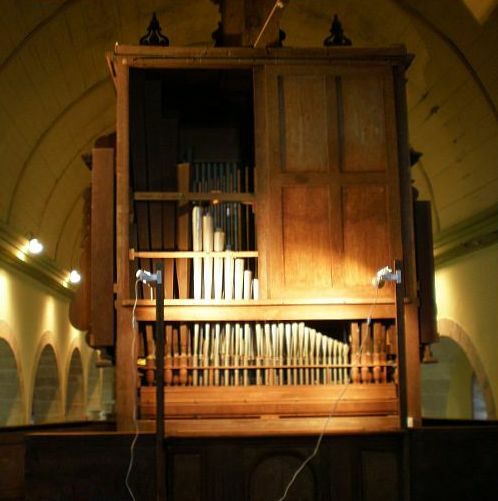 Considered unplayable in June 2006 by the diocesan commission for organs because of an attack of wood-eating insects, the instrument was dismantled, cleaned and treated in January 2007 by volunteers supervised by a retired organ-builder. A file describing the instrument and the nature of the preliminary work was submitted to the townhall for a request of classification and was also given to M Roland Galtier, technical adviser for the MH. The organ was heard again in its original state under the fingers of Jean-Cédric Salaün during the Sunday mass on March 8th 2007. The instrument has a transposing keyboard of 64 notes (54 active ones) and a 17-note pull-downs-pedalboard. N.B : Reverend Clergeau is the inventor in 1845 of the transposing keyboard mainly used on harmoniums. The keyboard and the pedalboard are situated at the back of the case. In the organ-loft down the aisle. – This organ could date back to 1850 and was attributed to Reverend Emile CLERGEAU. – It seems that the replacement of the two stops by the 16’ Bourdon has been made by Henri FIRMIN whose label can be seen on the wind chest. – Reverend LERAY, from Vitré, revised the instrument in 1929. – The organ builder Jean RENAUD installed a wind system in 1960. The instrument is surveyed by volunteers who cleaned it and stopped its degradation in 2007. Favorable. The sound of the instrument, of a very soft harmony , generously moves inside the vessel. – Recensement des orgues de Bretagne. Ministère de la Culture- Conseil Régional. ARCODAM-décembre 1987. – L’orgue Clergeau & lithurgie au XIX° par Maurice ROUSSEAU, a survey that lists 38 Clergeau instruments to date in France. – Emile CLERGEAU, Organs builder. 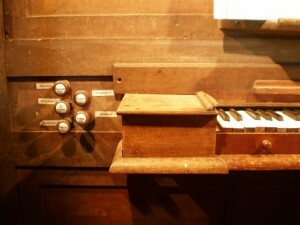 – A Clergeau organ in Corsican. You may discover another instrument , of a different composition but quite similar, as regards its size, its period and its musical and liturgical use. The Callac organ. – Joseph GUERNION and M. J.C. SALAÜN.